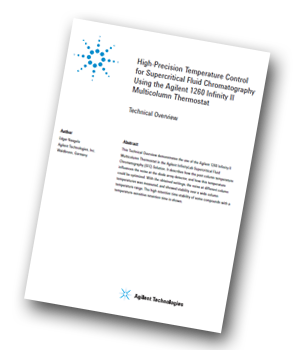 Agilent Technologies has produced a Technical Overview demonstrating the use of the Agilent 1260 Infinity II Multicolumn Thermostat in the Agilent InfinityLab Supercritical Fluid Chromatography (SFC) Solution. It describes how the post column temperature influences the noise at the diode array detector, and how this temperature could be optimized. With the obtained settings, the noise at different column temperatures was measured, and showed stability over a wide column temperature range. The high retention time stability of some compounds with a temperature-sensitive retention time is shown. Due to the high sensitivity of modern diode array detectors used in LC and SFC systems, the minimization of detector noise is crucial to reach maximum performance. Beyond the electronic noise, typical detector noise in any liquid chromatography detection system may be caused by refractive index effects. These effects are primarily caused by incomplete mixing of the solvents used, and temperature differences between the column and detector cell. The Agilent 1260 Infinity II Multicolumn Thermostat provides control of both temperatures; the precolumn temperature that determines the column temperature, and the post column temperature that adjusts the column effluent to the detector cell temperature. An optimization process for the minimization of detector noise is given, and the resulting noise over a broad range of column temperatures is displayed. The influence of the column temperature itself is demonstrated by using compounds whose retention is sensitive to temperature changes. A set of nine runs with different column temperatures between 20 and 60 °C (step 5 degrees) was done. Each run for the determination of the detector noise was 1 hour, and was done in duplicate. The noise was determined every 10 minutes over the run time, and reported by Agilent ChemStation as peak-to-peak noise. Finally, all values of peak-to‑peak noise obtained from one run were averaged and displayed in a chart showing column temperature against peak-to-peak noise. range of 20 to 80 °C was between 0.010 to 0.025 %. These excellent peak‑to‑peak noise and retention time RSD values can be achieved using the Agilent 1260 Infinity II Multicolumn Thermostat for column heating and post column temperature adjustment.